PIPELINE isolation specialist, STATS Group, has appointed two new directors as it gears up for major international expansion following a £7.8 million equity investment. Former Expro executive chair, Graeme Coutts, takes on a non-executive role in what is his first appointment since retiring from the global oilfield services company last year. In a 21-year career with Expro, Mr Coutts held senior roles, including president western hemisphere and chief executive officer, during which time the company was established as a world leader in well flow technologies, employing 5,000 people in 50 countries. Leigh Howarth, former managing director of Petrofac Training Services, has joined the STATS Group board as chief financial officer. In a 20-year career in the oil and gas industry, Mr Howarth’s roles have also included group finance director for Atlantic Power & Gas and he recently worked for exploration company, EnQuest, guiding the company through its IPO on the London Stock Exchange. Both directors were introduced to STATS by the Business Growth Fund (BGF), which recently acquired an £7.8 million equity stake in the Aberdeenshire-based company. BGF was established to help the UK’s fast-growing smaller and medium-sized businesses and the STATS investment marked the fund’s entry to the oil and gas industry. STATS Group chief executive officer, Pete Duguid, said: “The calibre of both Graeme and Leigh is outstanding and their appointments is a statement of clear intent that our business is embarking on an exciting new stage of development. Graeme Coutts revealed he had refused a number of offers to take up executive appointments since his retirement. He said: “I have had numerous approaches asking me to get involved in a variety of businesses but my criteria was very clear. I want to support local entrepreneurs who stand out from the crowd and will benefit from my experience. Leigh Howarth added: “Having worked with large international businesses I believe I bring a range of skills and a depth of experience which will benefit STATS as it seeks to consolidate its excellent reputation and to convert that in to international success. STATS Group designs, manufactures, installs and deploys a range of pipeline isolation tools which can make significant savings for oil and gas producers by limiting downtime in event of the need to isolate or shutdown a pipeline. Based in Kintore, near Aberdeen, the company employs 130 people in the UK, Canada, Middle East and Asia Pacific regions. Revenues of £14 million in 2011 are expected to grow by more than 75% in 2012 to around £25 million. ‘STATS Group’ is the recognised company name. The business was founded in Aberdeen in 1998 as Specialist Tools and Testing Services. STATS Group is a specialist engineering company and service provider that operates predominantly in the arena of piping and pipeline integrity and maintenance. We supply a comprehensive range of products and services, which enable piping and pipeline isolation, intervention, inspection, repair, connection, and testing work scopes. The majority of our works are undertaken on mature assets, typically process piping onboard offshore facilities (fixed and floating). We also supply products and services for infield and trunk pipelines both onshore and subsea, as well as onshore processing and distribution terminal facilities. Our key drivers of providing innovation, value and rapid response, has cemented our reputation in the UK-North Sea and other oil producing regions for always exceeding client expectations. Every product in the STATS portfolio is designed, manufactured, assembled and tested by our own in-house engineers and technicians. In 2009, STATS Group invested £5 million in a new headquarters at Kintore near Aberdeen, which includes 40,000 sq ft of workshops, storage and testing facilities. 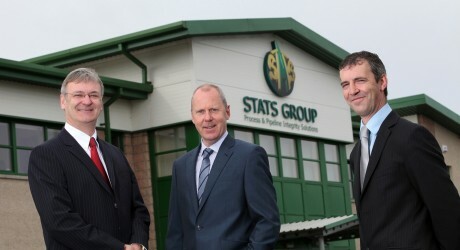 In February 2012, Business Growth Fund (BGF) invested £7.8 million in STATS Group. BGF was established to help the UK’s fast growing smaller and medium sized businesses. BGF is an independent company with capital of up to £2.5 billion, backed by five of the UK’s main banking groups – Barclays, HSBC, Lloyds, RBS, and Standard Chartered. BGF is managed completely autonomously with an independent management team. MEDIA RELEASE posted by Sure PR. You too can post media releases (aka press releases) on allmediascotland.com. For more information, email here.